Bio – Judith Ruskay Rabinor, Phd. 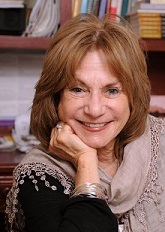 Judith Ruskay Rabinor, Ph.D. is a clinical psychologist, author, consultant and psychotherapist with offices in New York City and Lido Beach, Long Island. She has four decades of experience working with individuals, couples, groups and families. Judy is a frequently invited keynote and workshop presenter at national and international conferences, professional associations, retreat centers, universities and schools, including Harvard Medical School of Continuing Education, The Esalen Institute, Big Sur, California, National Association of Social Work meetings, The Renfrew Center Foundation Conference, The International Association of Eating Disorders Professionals, The New York City Board of Education and numerous university campuses including Princeton University and Barnard College. In addition to clinical work with patients, she coaches writers and offers consultation groups for therapists and other mental health practitioners. After obtaining her PhD in 1978, Judy focused her specialty on eating disorders, training at The Center for the Study for Anorexia and Bulimia in New York City. In 1991 she founded the American Eating Disorders Center of Long Island, an outpatient psychotherapy center on Long Island, NY. She has trained therapists as an instructor at Long Island University and as a supervisor of the Eating Disorders Group Therapy Program at Adelphi University, Garden City, New York. 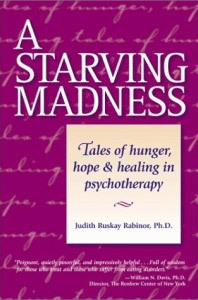 In 2002 she published A Starving Madness: Tales of Hunger, Hope and Healing in Psychotherapy (Gurze Books). Currently she consults to the Renfrew Center Foundation and is an instructor and supervisor at the Center for the Study of Anorexia and Bulimia in New York City. After decades of specializing in eating and body image disorders, Judy turned her attention to her own personal journey. 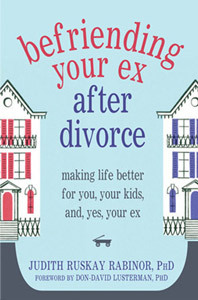 As a pioneer in the joint custody divorce movement, she published her latest book : Befriending Your Ex After Divorce: Making Life Better for You, Your Kids and Yes, Your Ex, (New Harbinger Publications). The book has been described as “brave, beautiful,” and “a must read for divorced, separated and divorcing parents.” Currently, she is writing a memoir about her mother. Judy’s different specialties are seamlessly woven together by her commitment to the power of relationships to heal. She describes her therapeutic approach as eclectic–experiential, relational, spiritual and practical, heavily influenced by The Relational Cultural Therapy of The Stone Center. This theory states that a sense of inner connection– to oneself, others and the universe– is the central organizing feature of life. In her clinical work, she helps people develop a deeper connection to themselves (to their thoughts, feelings and history) to others (friends and family) and to everything the universe offers that enhances a sense of aliveness, vitality and joy. In conjunction with Journey Mexico she conducts writing retreats in Puerto Vallarta, Mexico. She lives in New York City and Long Island with her husband, has two grown children and four grandchildren.